Until a few weeks ago I had very limited experience with Therm-o-web and their amazing products. I fell in love with them one by one when I pulled each new product out of the box. I adore the glitter photo corners and the Sticky Tape Mini Runner. The mini tape runner is the perfect size and is a great adhesive. I will be throwing it in my bag for my next crop! I'm guessing that most of us have a terrible photo that's taken with your phone in terrible lighting. Well, here's mine! A photo taken late at a night in a fast food restaurant with my sisters and myself isn't exactly a photo that's going to be hanging on my living room wall, but I did want it my scrapbook because it has a great story behind it. I cut the title with my Cameo and added lots of foam squares on the back to make it pop off the page. 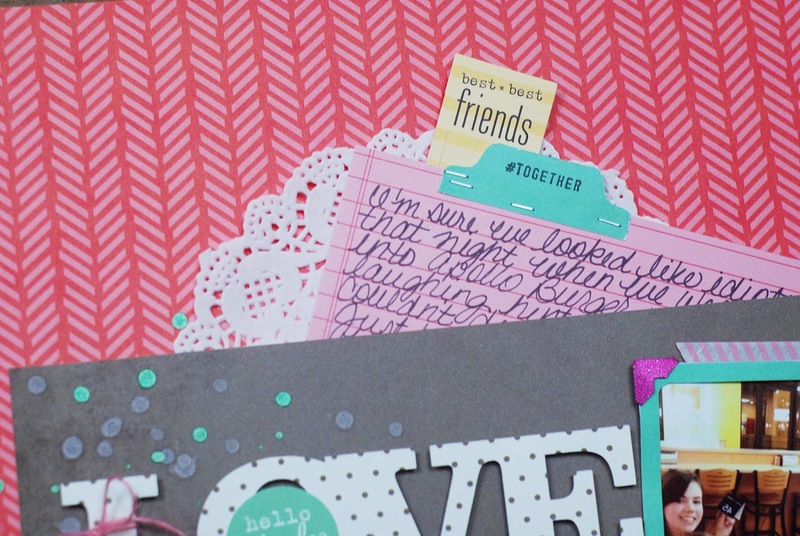 The journaling is hidden on this project. I created a pocket on the back of the black paper using a piece of scrap paper and double sided sticky tape from Therm-o-web. And here's my completed project. What do you think? Have you used a not so good photo to tell a story? I'd love to hear about it!